• Q: How is life Kieran? A: Good, thank God, work is going great. I have a two-year-old that loves my attention when I get home but hates when I have to head off to my other job, “training”. She thinks driving a choo choo train is what I’m at and wants to come along for the spin! Baby number two is also on the way so it’s all go in the Donaghy household at the moment. Kerry football is going great and we are looking forward to Croke Park and that’s always good. • Q: Speaking of Kerry how are you finding being back with the Kingdom considering in your autobiography you gave us the impression that last year was it? A: I did think last year was it. I told Eamon at the start of the 2016 season that I would make one more big push. Being dropped for the All Ireland Final as captain in 2015 hurt as I felt I had a bit more to give on the day so it was hard to retire on that. I got in the best shape possible for 2016 and played the whole league and championship in mid-field and did well out there. To be honest when we beat Tipperary in the Munster Final that year Eamon first planted the seed in my head to come back in 2017. It wasn’t a straight forward decision though, work was, and is still very demanding with PST Sport growing fast. I had my autobiography coming out in October and I had already told my family that the 2016 championship would be my last. I was also in the middle of setting up the new basketball club in Tralee, the Garveys Warriors, so there was a lot going on. • Q: Did you not have enough on your plate without starting a basketball club? 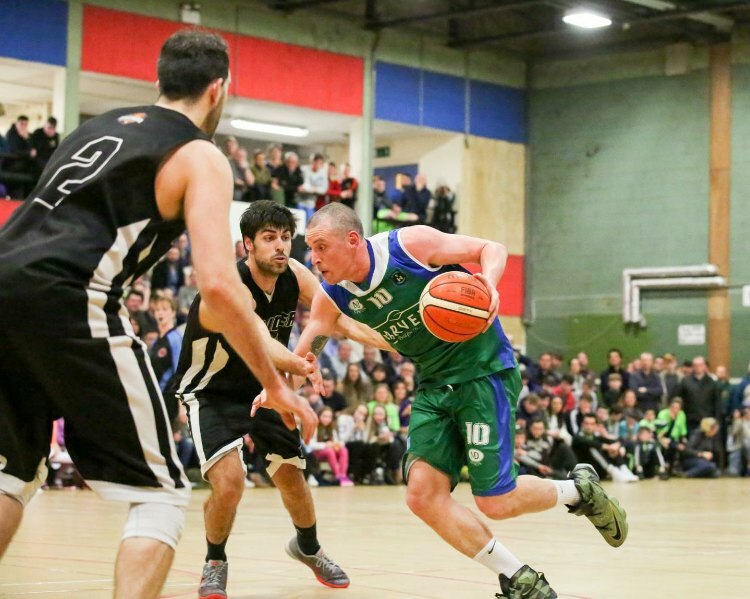 A: The foundations were there for top flight basketball in Tralee. I didn’t think I would be playing football in 2017 and knew there was only a few more years left in the body so I was determined to get it done while I could still play. I could see it every year at my basketball camp that there was massive love for the game in the town. The kids are now getting LeBron dunking and Steph shooting the lights out on the phones every day on social media. When I was young I was at the complex to see the Tigers and people were nearly hanging off the rafters. It was my dream to play for the Tigers, not Kerry. Now the kids had nothing to dream about and I was hell bent on changing that. I got Terry O’Brien, former chairman of the Tralee Tigers involved, as well as St Brendan’s chairman Pa Carey and Tralee Imperials chairman John Dowling who have 700 kids playing between them. They’re rival clubs in the town but we brought them together and structured linked them. It was like a UN peace keeping mission at times but people saw the vision I had and thankfully we brought it together. • Q: How did you find being back out on the courts of Ireland? A: I loved it, especially as I didn’t think I would ever play super-league basketball again. The travel was tough I must say as we had 9 games in Dublin, one in Belfast and the end of season playoffs were in Donegal. In saying that, basketball was good to me, I didn’t pick up any injuries, and we trained hard 4 times a week, plus games at the weekend. 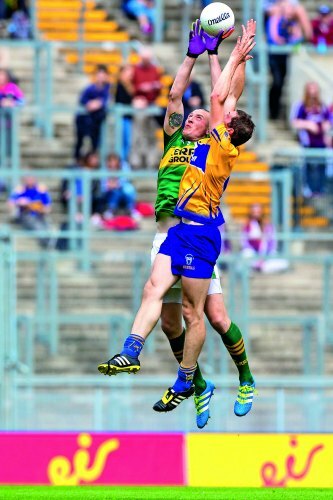 The up side to playing was the body was in good shape and I felt sharp enough to consider being a Kerry player again. • Q: When did you actually make the call on another season in the green and gold? A: I met Eamon in January 2017. He said I looked fit and we talked about where my hunger was at. I felt it was still there. He said to get to the gym with the Kerry boys 2 nights a week and said to keep up the basketball at weekends. I was happy to do that as I had given the Warriors total commitment at the start of the season. I felt I owed it to my teammates and fellow committee members to see the season out and give it everything I had. We ended up winning the Champions Trophy at the end of the season, that dragged out the basketball season by another two weeks missing the end of the football league. Coming down on the bus from Donegal after winning the trophy my mind was already drifting to Kerry football. I found out on twitter @starryboy14 that Kerry had beaten Tyrone and qualified for the league final against Dublin. • Q: You made that squad for the final, were you expecting that? A: No, is the honest answer. Eamon called me and said to come in for a gallop and see how I felt. I hadn’t touched a ball in months. The first night back training with the group I was like a young minor all over again, the excitement, the tension, the question marks. Was I still up to this level or will I get shown up? I didn’t eat a bite with the nerves all day. Maybe I should do it more often as I flew it, caught every ball, kicked points and set up a goal. I got the nod as the last man on the panel. I felt kinda guilty at first as a younger player who had trained all year was now missing out, but Eamon said ‘you are a viable option so be ready’ so that put my mind at ease. • Q: How is the season going for you so far? A: The season is going great, really enjoyable to be honest. There’s a great young group in there and they put together a great finish to the National League. Making the squad for the National League Final was a massive lift to the confidence considering that it was such a big game. I didn’t get a run on the day but I didn’t care. The experience of watching the boys grow as the game went on and eventually beating a great Dublin team going for 5 National Leagues in a row was massive. • Q: That’s 3 or 4 National Leagues for you, are they important to win and what stock do you think is put on the League? A: I think it’s getting more and more important every year and I think its stock is rising all the time. Division one is hard to win, and the games it’s producing year in, year out, over the last few seasons have been top drawer. • Q: Did you go back to the club football after the league? A: I did and it’s always great to get back to the Stacks boys. The following few weeks after the League are tough because you are trying to balance both club and county. Training was ramped up big time with Kerry to get work into the legs in that block of training. On top of that, the fact we had big county championship games with our club at weekends adds more pressure again. When the GAA eventually get down to restructuring the GAA season that’s the biggest challenge they have on their hands, how to make the season better for both the club and county player. • Q: The Munster championship semi-final VS Clare in Ennis looked dodgy at half time, how were you feeling at that point? A: I was a bit on edge, but the boys were calm in the dressing room. It didn’t look great but it looked even worse when Clare rattled the crossbar 5 minutes into the second half, that would have put us down 5 points with a man short. Donnacha was unlucky to get sent off but again everyone rallied and the subs that came on all did their job. Stephen O’Brien was brilliant and his goal was the dagger that eventually put Clare away. Ennis will always be a tough place to play so to get out with a 7 point win was huge and another step in the right direction for the team. I was happy with the way I played when I came on, made a big catch and didn’t make any mistakes. • Q: Were your skills rusty or were you fully up to championship speed at that stage? A: I think I was up to speed but there’s always room for improvement. Maurice Fitz worked on my kicking at the posts after we had finished a few sessions in the weeks leading up to the game. That gave me good confidence. 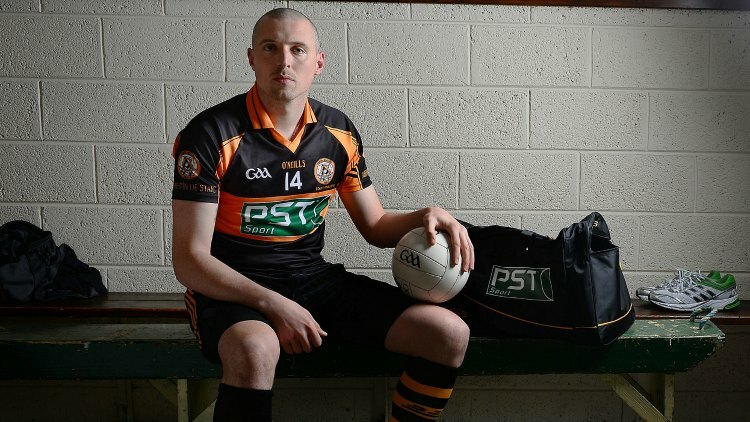 There was an evening where Bryan Sheehan was recovering from injury and was kicking the ball in to me. Maurice came up to put manners on me. I didn’t win a ball for a while, he was hanging out of me, pulling me, bumping me as I took off for a ball. I was getting half thick but he is a selector so I couldn’t do much. Eventually I won a few and then he shouted out to Bryan, “3 more balls so Bryan”. I was only getting into it so was a little disappointed but I did damage with those three and was delighted with myself as I headed to the dressing room. I found out the next night that Maurice had damaged his medial ligament, no wonder I got them last few balls so handy! Damien Ryle from our strength and conditioning team did a lot of work with me on winning a ball out in front, and above my head, landing and taking off at pace. He also worked on me slipping passes to him at speed. He took me on to the 3G synthetic pitch in Mitchells GAA complex and did a lot of speed work with ladders and hurdles to get me up to pace, he is a tough drill sergeant! • Q: Speaking of artificial grass pitches, what was your first experience with that type of surface? A: My first real experience of artificial grass was as a kid on the old style astro pitch. I was 12 and on my summer holidays with my uncle in Greystones. I thought I was playing in Wembley. We had nothing like it in Tralee at the time. Now we have 7 or 8 varying training size astro pitches in the town, 6 of them PST Sport installed in the last few years. Our latest artificial grass carpet is head and shoulders above anything else out there. It’s very exciting for me playing a key role in improving sports pitches for generations to come. • Q: Would the Kerry GAA team avail of astro turf pitches? A: We have used astro surfaces a few times with the Kerry senior team. We used a synthetic grass pitch up the country for a warm up before a game in 2010 and the boys loved it. We use a local artificial grass pitch in Killarney for training in January and February There are times the natural pitch just can’t take an Irish winter but thankfully we were able to get on the astro pitch and get the hard block of training done. A full size synthetic grass pitch is being built in phase two of the new state-of-the-art Kerry center of excellence project in Currans. This will ensure the Kerry teams to come will always have a pitch that’s playable 24/7, all year round. • Q: If you had a choice, would you train on artificial grass or natural grass? A: With Kerry we are very lucky to be able to train at Fitzgerald Stadium during the summer. It’s one of the best pitches in Ireland as it’s so well maintained, watered, spiked and cut regularly. It’s a dream to play on. However, other than the top stadiums I would choose an artificial pitch every time. When a natural pitch is wet and heavy in winter it leads to muscle fatigue and that can bring on an injury. Also during the summer if we get a few days/weeks of warm weather, the natural grass pitch can go rock hard in a short space of time, again leading to injuries like rolled ankles, sore backs and calves. I’ve discussed this at length with senior and underage managers in clubs where we have installed training size pitches. My advice is to take the team on the artificial pitch for most of the session, drills etc. Then, if you have the numbers and want to play a game take them out to the natural pitch for that. • Q: You mentioned Fitzgerald Stadium and what a great surface it is, the Munster Final was held there again this year against Cork, what was that like? A: It’s always great to play Cork. A Munster Final versus the Cork boys in Killarney is my favorite occasion outside of an All-Ireland Final. The buzz in the town, the banter, the colour, the sunshine, it all adds up to something very special and unique. I was going well in training and got the nod to start. At 34 and only with the panel for 12 weeks, that was a further boost to the confidence levels. I was nervous before the game of course…to be expected when you’re playing your age old rivals and without setting the world alight I did well. • Q: What was the buzz like afterwards, were there big celebrations that night? A: A few pints as always but it was hectic. They opened the pubs at 11 that morning so by the time we got to town people were gone stone mad. We went to Darren O’Sullivans’s new pub Rosspoint the next day and that was great fun. I had a long drive to Belfast on the Tuesday which was tough. • Q: What took you up there? A: I got the opportunity through a great charity called Sport Changes Life to play in the Duty Free Irish Pro-Am in Portstewart. They are the same charity along with the Rory foundation that are bringing the Naismith Hall of Fame Classic to Belfast and it will be the first official US College basketball tournament played outside of the US and I can’t wait to go to it. I actually met Rory up there and that was a good buzz. Nice fella, I had a chat with him and his dad and a picture taken. I told him that we (PST Sport) had just finished a new hockey pitch at his old school in Holywood. I played with a South African pro, Dylan Frittelli. He was excellent and helped us around the course, giving us exact distance to the hole and he was good craic too. Also on our team was Shane O Hara, the pool trick shot champion who won his place on the team. Check out his shot on YouTube, it’s unreal! We came second so we were delighted and were pipped by Padraig Harrington in the end. I must say it was a quiet week on the work front, Friday wasn’t much fun trying to get back up to speed with things. • Q: Speaking of work, how did you come to work for PST Sport? 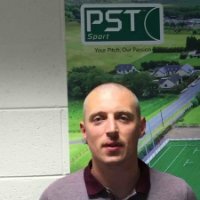 A: I did an exercise for PST Sport a few years back as they were trying to innovate and come up with the best type of playing surface for artificial grass pitches. They set up 3 lanes outside their warehouse with the same carpet but using different shock pads and different infill levels. I did over 100 60m sprints on each track. One day running, with one day rest and I did the runs in a set time limit to ensure an accurate reading on how my legs felt the next day. At the end of the week I reported my findings on what I felt the best surface was. PST Sport were then able to combine my practical results with the laboratory tests they had carried out and come up with the best system in the market. Not long after that I did a motivational talk to their staff about team work and it was well received by the team. Shortly after that Colin the MD called me and offered me the role of Business Development Manager and I jumped at it. I could see from my talk and how well things were going that PST’s graph was on the rise. The Irish rugby team trained on a PST Sport pitch at Mullingar Rugby Club during the Six Nations last year. The players gave the same feedback as I did on our surface so it gives us great confidence when selling the benefits of our system. Joe Schmidt even says it was like playing on the Twickenham surface – click here. We can’t get much better praise than that! • Q: Do you have interest in the Rugby, did you ever play? A: I do, I love watching all the provinces in action especially Munster obviously. Thomond Park on a European Cup night is special. I love watching the game when it’s played at the highest level, especially the Ireland games…there’s always massive roaring at the TV. I read a quote by Ronan O’Gara one time where he said if the GAA didn’t exist Ireland would be even better when it comes to Rugby. His point was that most young people and athletes are all stuck in the GAA from the start. He is not too far off with that statement as if we were all brought to the rugby pitch at the age of 4 we’d be like the All Blacks. I played at full back for Tralee in one game, I went to watch my friends play and ended up out there on the pitch. The manager said stay back there inside that line (the 22) and if they kick it, you catch it and kick it out over the line. Simple auld game! • Q: Do you feel artificial grass pitches are beneficial to athletic performance in all field sports? A: Artificial grass pitches used to be all about shock absorption but I feel energy restitution is more important to an athlete’s performance. This is all about how much energy the surface takes out of the athlete playing on it. It’s something that’s not discussed very often but ask any top level athlete and they will tell you how they feel playing on a good surface versus a bad one. I use the analogy when trying to explain it – if you were at the beach for a run you can get varying types of energy restitution. Up in the dry soft sand it’s much harder to run as the sand is soft. You’ll be slower and it kills the legs, puts pressure on muscles, fatigue levels are high which increases the risk of injury. Down where the tide has gone out the sand can be firm so the energy restitution is much higher, maybe even too high. You feel okay but that can be hard on the lower back and calves. That PST experiment that I mentioned earlier was all about finding that perfect middle ground. Trying to develop a surface that took the least amount of energy out of an athlete’s legs while having adequate shock absorption levels. The fact that I played a key role in developing our system makes me even more passionate about the difference we are making to clubs, schools and communities around Ireland and the UK. Q: Do these pitches need much maintenance when they are installed? A: You probably have heard people come off an artificial surface and say that their back is sore or that it’s rock hard. That’s just because the infill has been allowed to compact and become hard over time. They need decompaction once/twice a year and that’s not a big deal. Our team would carry out a full maintenance in a day. Proper maintenance ensures a safe and top class playing surface and will extend the lifespan of the pitch. • Q: What sports use an artificial surface the most and why? A: Most field sports use artificial surfaces these days. Hockey is all artificial surface, water based and sand dressed. Soccer in Russia use a lot of artificial pitches due to their bad weather. Rugby and soccer in the UK and Ireland are both getting on board with having a facility that has perfect playing conditions and characteristics all year round. The GAA are the same and have really embraced artificial grass. We see everything from full size pitches like the 13000m pitch we installed at Le Chéile Secondary School in Tyrrrellstown to a small national school in Puckane, Co Tipperary. What sport uses this type of surface the most? I think you have to look to the NFL (American Football) in the States as they are the market leaders when it comes to artificial pitches. This sport puts more pressure on bones, joints and ligaments than any other sport out there. The speed and sheer size of some of these guys is frightening. Out of the thirty-one teams nearly 75% of them use astroturf pitches in their stadiums and nearly 100% have an artificial pitch as the training facility. When I leap high for a ball, I like the fact of knowing when I land what my footing will be like. No divots, no holes, no soft or hard ground, just a surface you can trust, that’s important to all athletes at all levels. I think why so many of these stadiums have gone with artificial pitches is down to the fact they think it’s a safer playing surface all year round. • Q: Speaking of American sports will you be playing Lebron James and the rest of the USA Dream Team when you represent Ireland in 2018? A: No, I highly doubt it unless they want to come on a team holiday to Ireland for a bit of team bonding and a few pints of Guinness. First, I must make the final 12 of the Irish squad for the European small nations. I’m looking forward to the battle and improving my game. By playing with the best players in Ireland I will only improve. The season ahead with the Tralee Warriors is big for me on a personal level and for the team. I was delighted to get the call from head coach Pete Strickland. He is a famous coach in America and a god in cork when he played with Neptune during the glory days of Irish basketball and I can’t wait to learn. I see myself coaching in both codes when I retire so I will be like a sponge around Pete and as the great BUFF Egan says “ill be soaking it in man”. • Q: Getting back to football the All Ireland Quarter Final against Galway on Sunday, are you looking forward to it? A: I am and I can’t wait to get on the train Saturday morning with the team. I have played them twice in Championship football and both times it was a battle right to the very end. In 2008, we were going for the three in a row and it was an epic in the worst conditions I’ve ever seen in Croke Park. Jones Road outside the Hogan Stand flooded and they had to turn on the lights. In 2014, they also pushed us right to the end and we just about came out the right side. They have improved a lot since then and it should be a great game for the neutrals as both teams will go out to play football. They have great forwards that have everything you need to cause teams trouble. We saw that the way they dismantled a well organised Donegal team last weekend. That game was 4-4 after 22 minutes, that was a real Donegal styled game, looking like a dog fight to the end. Galway went in at half time up by 11, that’s 3-5 in 13 minutes and that’s unbelievable scoring talent. They have serious pace with Danny Cummins and Shane Walsh, power and aggression with Damien Comer at full forward and the kicking abilities of Michael Daly on the forty. The work rate and fitness got Johnny Heaney 2 goals and 2 points from wing forward. On top of that, they had the class and experience of Sean Armstrong and the great Michael Meehan. Kevin Walsh has them well organised and they play to a good structure and have the legs to counter attack. We will have to be at the top of our game to get the result we want in Kerry and that’s the way it should be when it comes to knock out football. I hope the Kerry fans come in big numbers. There are 3 Connaught teams up there so we need our supporters to make plenty of noise. • Q: It sounds like you’ll be busy in the coming weeks and months, what does the future hold for Kieran Donaghy? A: I don’t like to look too far down the road as it can be quite daunting. I’m happy is one thing I can say; my family is healthy and that’s the main thing for me. Sport is going well, looking forward to the big game on Sunday. Basketball is in the preparation stage right now, trying to finalize sponsors, gear and players contracts. And finally, work is going well, we have a great crew in the office in Tralee. Our team on site work hard to produce world class sports facilities. Whether we are doing projects for high profile clubs like Chelsea FC and Aberdeen FC or a small mini pitch for a primary school somewhere in Ireland, we deliver a world class surface every time.